Bishop of Lindisfarne, patron of Durham, born about 635; died 20 March, 687. His emblem is the head of St. Oswald, king and martyr, which he is represented as bearing in his hands. 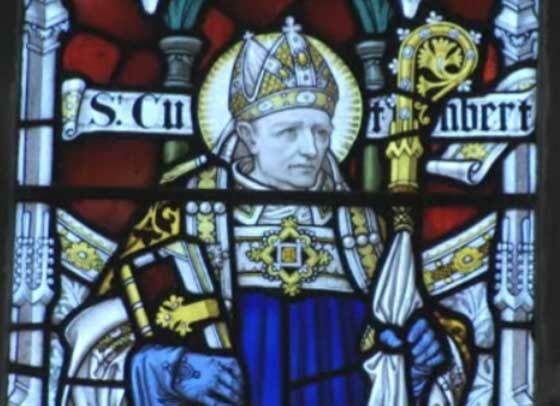 His feast is kept in Great Britain and Ireland on the 20th of March, and he is patron of the Diocese of Hexham and Newcastle, where his commemoration is inserted among the Suffrages of the Saints. His early biographers give no particulars of his birth, and the accounts in the "Libellus de ortu", which represent him as the son of an Irish king named Muriahdach, though recently supported by Cardinal Moran and Archbishop Healy, are rejected by later English writers as legendary. Moreover, St. Bede's phrase, Brittania . . . genuit (Vita Metricia, c. i), points to his English birth. He was probably born in the neighbourhood of Mailros (Melrose) of lowly parentage, for as a boy he used to tend sheep on the mountain-sides near that monastery. While still a child living with his foster-mother Kenswith his future lot as bishop had been foretold by a little play-fellow, whose prophecy had a lasting effect on his character. He was influenced, too, by the holiness of the community of Mailros, where St. Eata was abbot and St. Basil prior. In the year 651, while watching his sheep, he saw in a vision the soul of St. Aidan carried to heaven by angels, and inspired by this became a monk at Mailros. Yet it would seem that the troubled state of the country hindered him from carrying out his resolution at once. Certain it is that at one part of his life he was a soldier, and the years which succeed the death of St. Aidan and Oswin of Deira seem to have been such as would call for the military service of most of the able-bodied men of Northumbria, which was constantly threatened at this time by the ambition of its southern neighbor, King Penda of Mercia. Peace was not restored to the land until some four years later, as the consequence of a great battle which was fought between the Northumbrians and the Mercians at Winwidfield. It was probably after this battle that Cuthbert found himself free once more to turn to the life he desired. He arrived at Mailros on horseback and armed with a spear. Here he soon became eminent for holiness and learning, while from the first his life was distinguished by supernatural occurrences and miracles. When the monastery at Ripon was founded he went there as guest-master, but in 661 he, with other monks who adhered to the customs of Celtic Christianity, returned to Mailros owing to the adoption at Ripon of the Roman Usage in celebrating Easter and other matters. Shortly after his return he was struck by a pestilence which then attacked the community, but he recovered, and became prior in place of St. Boisil, who died of the disease in 664. In this year the Synod of Whitby decided in favour of the Roman Usage, and St. Cuthbert, who accepted the decision, was sent by St. Eata to be prior at Lindisfarne, in order that he might introduce the Roman customs into that house. This was a difficult matter which needed all his gentle tact and patience to carry out successfully, but the fact that one so renowned for sanctity, who had himself been brought up in the Celtic tradition, was loyally conforming to the Roman use, did much to support the cause of St. Wilfrid. In this matter St. Cuthbert's influence on his time was very marked. At Lindisfarne he spent much time in evangelizing the people. He was noted for his devotion to the Mass, which he could not celebrate without tears, and for the success with which his zealous charity drew sinners to God. St. Cuthbert was buried in his monastery at Lindisfarne, and his tomb immediately became celebrated for remarkable miracles. These were so numerous and extraordinary that he was called the "Wonder-worker of England". In 698 the first transfer of the relics took place, and the body was found incorrupt. During the Danish invasion of 875, Bishop Eardulf and the monks fled for safety, carrying the body of the saint with them. For seven years they wandered, bearing it first into Cumberland, then into Galloway and back to Northumberland. In 883 it was placed in a church at Chester-le-Street, near Durham, given to the monks by the converted Danish king, who had a great devotion to the saint, like King Alfred, who also honoured St. Cuthbert as his patron and was a benefactor to this church. Towards the end of the tenth century, the shrine was removed to Ripon, owing to fears of fresh invasion. After a few months it was being carried back to be restored to Chester-le-Street, when, on arriving at Durham a new miracle, tradition says, indicated that this was to be the resting-place of the saint's body. Here it remained, first in a chapel formed of boughs, then in a wooden and finally in a stone church, built on the present site of Durham cathedral, and finished in 998 or 999. While William the Conqueror was ravaging the North in 1069, the body was once more removed, this time to Lindisfarne, but it was soon restored. In 1104, the shrine was transferred to the present cathedral, when the body was again found incorrupt, with it being the head of St. Oswald, which had been placed with St. Cuthbert's body for safety — a fact which accounts for the well-known symbol of the saint.